iPhone doesn’t allow you to set songs as ringtones. But you can customize the ringtones with free ringtone maker for iPhone. These ringtone makers will also help you to add them easily on your iPhone. Let us now discuss the top 7 best iPhone ringtone makers in detail. iMyFone TunesMate is a powerful iPhone music manager that allows you to transfer songs between iPhone and computer. Its “Ringtone Maker” features makes it much easier to set a song as ringtone on iPhone. It gives you full control of your iPhone files by passing iTunes annoying limits. You should give it a try if you need to create ringtones for your iPhone. It wll supported all iOS versions, including the latest iOS 12. Make Ringtone Smartly: You can create your custom tones the way you like, cut songs from computer or iTunes, save ringtone to computer or iPhone directly, make ringtones smoothly, etc. Listen and Make: Decide the stop and end time for the tone while listening to the songs. You can preview the tone before saving it. Mult-Formats Supported: Unlike iTunes, all the music formats are supported to make ringtones for iPhone, like MP3, M4R, WMA, M4A, OGG, AAC, etc. Two-way Transfer: Transfer ringtones freely between iPhone and computer, between iPhone and iTunes without data loss, as does music, videos, photos, playlists, and more. Step 1: Connect iPhone to computer and Launch TunesMate Ringtone Maker. Click Music tab at the top and then click Ringtone Maker. Step 2: Select song of your choice by “Local Music” or “Device Music”. Listen to music and select the region you want as your ringtone. It should be less than 40 seconds long. Step 3: Use “Ringtone Audition” to preview the ringtone and then ‘Save to Device or PC’. Fade in and fade out: It’s the feature that will make the ringtones sound smoothly. TunesMate was reviewed and recommended by lots of software review sites, like getintopc.com, tricksworldzz.com, crunchytricks.com, etc. It converts all mainstream audio and video formats like MPEG, AVCHD, AVI, MP3, MP4, etc. into the M4R iPhone ringtone maker. This free iPhone ringtone maker directly sends the customized ringtone to the iPhone. 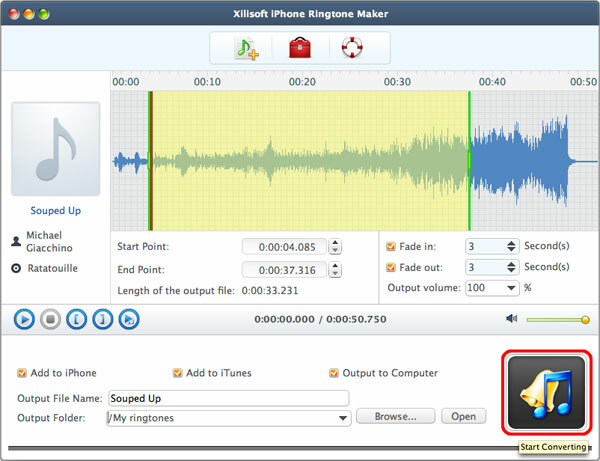 If the users loved any music clip then with the same start and end time the Xilisoft iPhone Ringtone Maker turns it into the ringtone. The built-in music is available for the preview of the audio or video before conversion. It’s a little confused to use. You can't save the custom ringtones to iPhone directly. Free Ringtone Maker is an onlime ringtone maker which requires you to update the tones to its website first. Then you can convert the song to .m4r tones by deciding the start and end time. It cannot make any iPhone song as the ringtone. You can just make the ringtones, but it can’t help you to transfer the ringtones to your iPhone. It needs great network connection. 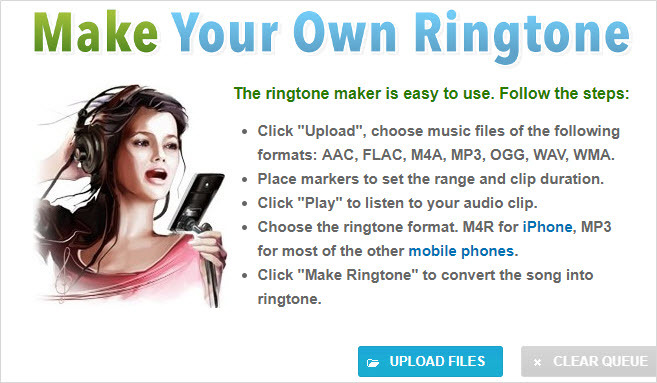 Ringer is another online ringtone maker for multiple formats, like AAC, FLAC, M4A, MP3, etc. It also helps to convert songs in other format to MP3. Of course, you need to update your song to their service first. It only makes ringtone using your computer music. If the song is in your iPhone, you need to extract music from iPhone first. Cut MP63 works as a ringtone maker that cuts only MP3 files and helps the users to make customized ringtones. Users can make ringtones online without losing its quality. It’s only compatible with MP3 music files and does not support YouTube links. You need to install the Flash Player in version 10 or higher. 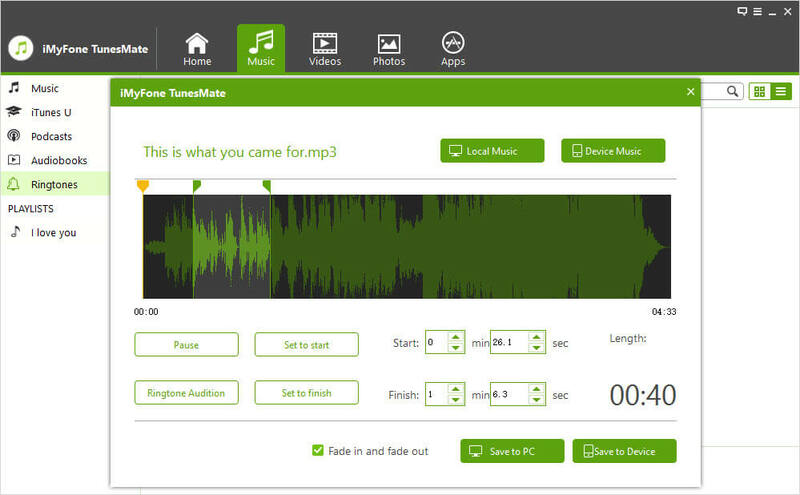 The Audio Cutter is used to edit the multiple audio formats to create the ringtones for the iPhone. It takes the help of the Waveform Zooming that supports in handling the extensive music tracks. Users can cut multiple portions of the long track. It creates the 40 seconds long ringtone saved in the M4R Format. If you want to make ringtone using music in iPhone, you need to transfer it to computer first. You can save the custom locally, but not to your iPhone directly. In general, the iMyFone TunesMate ringtones maker is highly recommended as it's easy to use and directly save the ringtones to your iPhone or iPad. It also gives you options to manage the ringtones on your iPhone efficiently. Download TunesMate here and have a shot. You would love it.